Here's the problem: you want to know when certain things get mentioned on the web, but you're not about to search it every day. 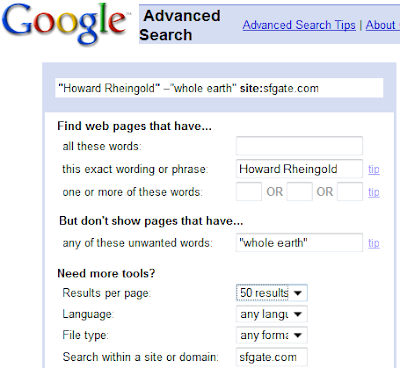 Wouldn't it be great if a search could persist over time and alert you when new results appear? Good news--not only is it possible, it's also pretty easy, and by the end of this tutorial, you'll know how to do it. ... and it would prevent those hits from ending up in your search results (though be careful, as you wouldn't want to exclude a hypothetical page that offered a "related posts" section that mentions "smart mobs"). If you don't use Google Reader (and you should! 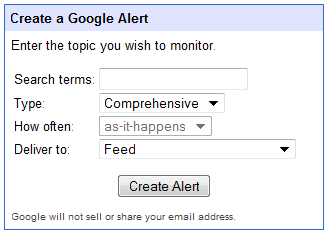 ), you can set the Google Alert to send you an email. This might be useful if you wanted to create a list of people to send updates to using filters in gmail, but that's a post for another time. Congrats--now you know how to create persistent searches using Google Alerts! Use it for vanity searches, to stay on top of a brand, etc. I use it to find out whenever anyone favorites any of my Tweets.